Mr. Gregory Shriek—not his real name, for reasons that will soon be obvious—was a classroom tyrant. He was a great example of a bad teacher. He was also my first high school composition instructor. He knew what he wanted from the students in his Introduction to Creative Writing class, and he was willing to bully us to get it. “Lean, spare prose,” he demanded. “None of this fancy, frilly, silly stuff.” Mr. Shriek liked strong nouns and dynamic verbs. Using a “to be” verb (a copula) would get you a piercing glare; use two or more, and Mr. Shriek’s brow would sweat and his hands would begin to clench. Needless to say, the students at the top of the class produced prose as colorful and exciting as a shopping list. We’re not even going to talk about the three-week unit on writing poetry; some events are still too painful to recall, even many decades later. Eventually, I regained my confidence to decide for myself what constitutes good writing. I like adjectives. They add flavor and passion to writing. More to the point, they refine the meaning of nearby nouns, creating an effect that no nouns alone can achieve. Adjectives are good. Never be afraid to use them as needed. Ironically enough—not that he would recognize irony if it walked up and bit him on the knee—Mr. Shriek’s mantra of “lean, spare prose” itself contains two adjectives. But that’s not really our topic today. Today, we’re going to look at a tiny question that will plunge us deep into grammar theory: what the dickens is going on with that comma between lean and spare? Now and then, you will want to use a series of adjectives before a noun. And that’s perfectly okay, unless you’re a high school student being graded by an obsessive teacher. I saw a fierce, shaggy, growling dog. I saw a growling, fierce, shaggy dog. I saw a shaggy, growling, fierce dog. You face an automatic, lengthy suspension of driving privileges. Come meet our friendly, skilled customer service team. Make sure to eat plenty of green, leafy vegetables. You will be treated by our compassionate, professional podiatrists. We have the skills to outmaneuver even a clever, ambitious district attorney. Sometimes, though, the adjectives in a series do have a distinct priority. We call these cumulative adjectives, because each adjective has a cumulative effect on the overall meaning of the phrase. The adjective at the start of the series refines the meaning not only of the final noun, but also of all the other adjectives in the series. Are you ready to meet with our experienced estate-planning lawyers? Suppose you were taking a vigorous morning jog today. Early on, we will appraise the value of your combined marital assets. Serial adjectives can be sorted into two different types. Visit our clinic for a comprehensive hearing exam. In contrast to coordinate adjectives, we cannot mix up the adjectives in any random order that suits us; it just doesn’t “sound right,” because the cumulative effect doesn’t build up when the terms are out of sequence. Also, we never use commas to separate the adjectives, because commas denote equal importance. Of course, as with so much of English grammar, the tricky part comes in telling which case applies: coordinate adjectives and cumulative adjectives. Truthfully, in some cases the answer is both; yes, it’s possible to mix types within a sequence of adjectives. But for right now, let’s just focus on tests to distinguish the basic conditions. This will be easy, because there are only two tests to apply. And to help with understanding how the tests work, we’ll use a cumulative adjective phrase: sour lemon candy. Can we all agree that’s cumulative rather than coordinate? 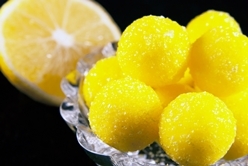 The word “sour” spreads its meaning over both “lemon” and “candy”, but “lemon” modifies only “candy,” so the total meaning of the phrase builds as we move forward. That sounds like a cumulative series to me. For the first test, separate the adjectives with the word “and” and ask yourself whether the phrasing sounds okay and the meaning seems unchanged. Does sour and lemon candy seem equivalent to sour lemon candy? Not really. That and the “and” we added makes it seem like the adjectives are equally important, and they’re really not. If adding “and” seems to change the meaning, we’re probably working with cumulative rather than coordinate adjectives, so no commas are needed. In the second test, rearrange the order of the adjectives and see if the meaning changes. Once again, our sample phrase fails the test: lemon sour candy seems subtly different from sour lemon candy. If the meaning is different when the adjectives are in a different order, that’s a sign we have cumulative adjectives, so again no commas are needed. Is This a Big, Hairy Deal? Or Just an Itty-Bitty Deal? Ah, but they will notice. Studies have shown that people have an intuitive grasp of grammar and can tell when something’s wrong, even if they may not be able to pinpoint the error. A few paragraphs ago, we talked about high school students being graded by their teachers. Now, you’re no longer in school, but let there be no mistake: you are still being graded. Your readers—potential clients and customers—are rating you right now. They decide whether to trust you based on the quality of your writing. If you heedlessly make errors, you risk being perceived as uncaring or scornful of the people who are looking to you for help. That’s not the optimum marketing approach. Foster Web Marketing is happy to assist business owners and managers with dangerously weak writing skills. And even those who are expert writers can profit from our FREE assistance, including our Client’s Guide to Great Content and this series of essays on grammar, usage, and punctuation. If there’s something more you want, let us know by submitting ideas in the comment section of this page or by giving our experts a call at 888-886-0939.